By no fault of their own, most defendants are ignorant to the Federal courts, the criminal justice system and federal criminal trial process, and often confused by what lawyers tell them. Since we’re not lawyers we can’t give legal advice. But we do is help clients by explaining criminal laws and guide them into understanding what they’re facing, and the implications of going to trial versus taking a plea. With our help, clients become educated quickly as to what is happening to them, what steps the prosecutor and Judge will take by procedure in the court process, and what will most likely happen next. While lawyers may try and explain to defendants about the criminal justice system, many defendants walk away confused and do not understand what they are really facing, and what the steps take place after a defendant has been charged in Federal Court. We take the mystery away! We explain to our clients in detailed but plain language exactly how the court system works. Education is the key in making informed decisions when your freedom is at stake. Unfortunately many lawyers give clients false hope they’ll get probation as a tool to get them to retain them, when in fact the law itself may mandate custody! Although we cannot and will not make decisions for clients, we do bring relevant information to their attention that their lawyers, or most likely their paralegal may have over-looked that could have serious implications regarding the amount of time they end of being sentenced to, or being hit monetary fines or restitution. Call (855) 577-4766 and speak to a Prison Consultant now. 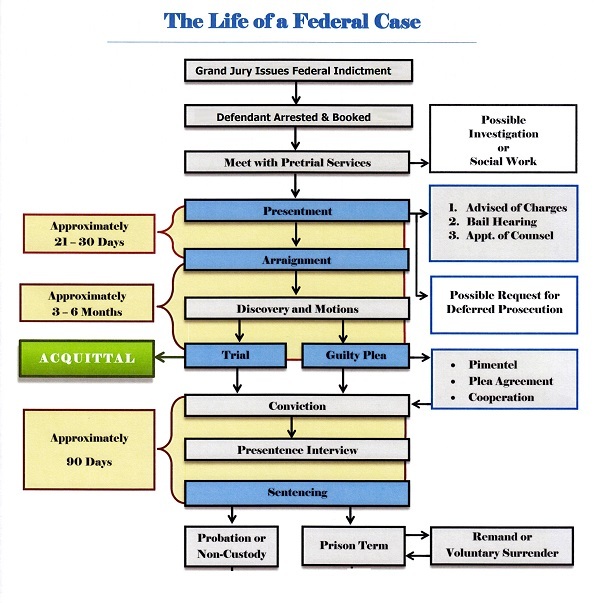 We offer free consultations on on the federal trial process. Let us help you make educated decisions on your legal issues.